Court Guard giant-sized tiles protect gym floors while providing a multipurpose, temporary flooring solution for concerts, trade shows, dances and graduations. Easy to install, simply lay the loose tiles on the area you would like to protect. Court Guard tiles are made from high-quality, polypropylene fiber, have a fully recyclable backing and feature a needle-punch design that prevents tiles from fraying. Cover your entire floor or use individual tiles as protective runners or entrance mats. 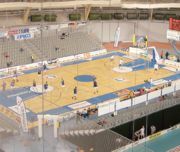 PlybooSportTM bamboo athletic flooring is a response to the growing demand for a LEED® qualified sports floor. PlybooSport will install over most existing athletic floor systems that are appropriate for standard 3/4-inch maple flooring. With precision milling and tight manufacturing tolerances, PlybooSport requires less sanding and labor than the alternatives. Available in a natural edge grain design, this product can be sanded and refinished like maple for a durable and long-wearing surface. PlybooSport comes in a standard 3/4-inch by 2 1/4-inch by 72-inch dimension and is a contributing finish under the 6.0 Section of the LEED® Materials and Resource Point System. Aeson Flooring's Hardwood Flooring System is a portable or permanent Bona X finished hardwood sports flooring system with a state-of-the-art, prefabricated subfloor. Exceeding DIN, EN and FIBA standards for quality and performance, this professional-grade floor is ideal for basketball, aerobics and multipurpose athletic activities. The Hardwood Flooring System offers superior energy absorption and resilience, is custom-made to client specifications and is available in many pre-finished species, including oak, maple and ash. It includes a lifetime guarantee when installed by a certified Aeson installer and maintained with Bona X products, or a one-year material defect warranty when self-installed. The Maple Flooring Manufacturers Association (MFMA) is the authoritative source of innovative technical and general information for maple flooring and related sports flooring systems. Through cooperative member programs, MFMA establishes product quality, performance and installation guidelines to educate end users about safety, performance and maintenance issues, and promotes the use of maple flooring products worldwide. 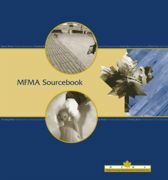 Now the MFMA has combined all of its information in one easy place, the MFMA Sourcebook. The MFMA Sourcebook has expanded listings of all members, along with MFMA's library of technical information, MFMA position statements, order forms, information on MFMA's Inspection services and more. Wrestling rooms and training facilities need to provide a durable and shock-absorbing surface suitable for proper training and technique. Resilite mats offer superior impact protection with industry-leading foam technology. Resilite is the only manufacturer to offer Microban antimicrobial product protection built directly into the vinyl coating to help prevent the growth of stain- and odor-causing bacteria, mold and mildew. PaviGym Aerobic tiles featuring the patented Re:ACT system combine high-resistance E2 polymers with an advanced air matrix system that provides a point elastic surface that is five times more shock-absorbent than wood. PaviGym modular tiles are available in a large selection of colors that will fit any design. Flexgard® EVA Interlocking Floor Tiles are lightweight mats made of high-density, durable, closed-cell EVA (Ethylene Vinyl Acetate) foam. Four-sided interlocking tiles make for simple installations. They are slightly textured for a slip-resistant surface, and are reversible in grey/black or blue/red combinations. Create a clean, quiet, soft workout area for any floor. Tiles are 40 inches by 40 inches by 7/8 inch. (Beveled edges and corners are available for a finished look.) Flexgard® Interlocking Tiles for fitness and workout areas are moisture- and odor-resistant and also protect your existing floors. Ideal for weight rooms, cardio areas and circuit training areas. The 2-foot by 2-foot by 3/8-inch tiles are also available in rolls. No Fault Sports Floor is an effective and ideal choice for sports surfacing or flooring in your fitness or recreational facility and is available for multiple applications. It can adjust to meet the specific conditions of your facility. Resilient, durable and easy to maintain, No Fault Sports Floor is available in a variety of colors and is simple to install, helping you achieve the custom look you desire. It comes in 4-foot-wide rolls and custom-cut lengths or in interlocking 2-foot by 2-foot Zig Zag Tiles. No Fault intends to be your one-stop shop for all of your sports and safety surface needs.